Why do we Need Cognitive Behavioural Coaching? Frankly, there’s a lot of wibble out there about self-help and how some self-proclaimed expert coaches can help you with their marvellous get well/fit/rich methods. Yes, I’m pointing at you, Mr £&$^$ &*@%& (redacted by Editor). Yet there are some methods that are backed by more research than the self help industry has had hot-smoked salmon and champagne. And we need those methods to gain more traction. The stoics pretty much nailed it! We’ve just been adding layers ever since. And Cognitive Behavioural Coaching is one of those layers that is truly helpful. So, What is Cognitive Behavioural Coaching? There have always been two approaches that therapeutic psychologists have available: the cognitive and the behavioural. Cognitive approaches focus on exposing what is going on in our unconscious minds. Behavioural approaches look at our responses to stimuli – how external events trigger behavioural outcomes. Each approach has its strengths and weaknesses. What if you could combine the benefits of both. Cognitive Behavioural Therapy does. Its origins lie in Albert Ellis’s Rational Emotive Behavioral Therapy (REBT). Since then, researchers and therapists have built on those foundations with a heap of tools and research-based evidence for what works, and when. Cognitive Behavioural Coaching is an approach to coaching model that draws on CBT. It offers exercises, activities, and models that allow a coach to help their clients to identify and challenge unhelpful thoughts, feelings and behaviours. It starts with the insight that events can trigger negative thoughts. These lead to negative emotions. And negative emotions lead to unhelpful behaviours. The real damage comes as those behaviours feed-back into outcomes that trigger new thoughts. The end result can be chronic effects on our emotional, mental and physical wellbeing. I listed some of the behavioural outcomes that all this can manifest, at the the top of this article. Cognitive Behavioural Coaching interrupts the sequence of Event-Thought-Emotion-Behaviour. This gives the client a new perspective about the roots of their problem. And, like all coaching, it aims to eventually give the client the ability to reach their full potential. Having sought to distinguish the basis of Cognitive Behavioural Coaching from the mass market easy-solutions business, do you really think I’m going to pretend I can tell you how to do it in a few short paragraphs? Pahh! 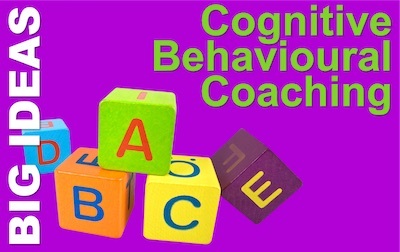 To understand the underpinning idea of Cognitive Behavioural Coaching, we need look no further than the ABC. The ABCDE model is the single most valuable part of the toolset. And it’s easy to grasp. It’s equally easy to see how and why it works. There is little more I need to say than is summed up in the graphic. We know the problem does not come from the event itself. But the first step is for the coach to help their client identify what situations or events trigger the unwanted responses. A coach will also explore what thoughts and emotions arise as a result of the activating event. What are the internal and external consequences of the beliefs acting on the activating events? All or Nothing Thinking is where we think in terms of two polar opposites and fail to see any intermediate options or alternatives. There’s no middle ground for you, if you get locked into this mode. Spry suggests the coach challenges for evidence of the poles, and presents ways to see the shades and hues in between them. The last step is for the coach to deploy techniques to help their client to embrace new, resourceful, balanced thoughts for their old and distorted think patterns. This, to me, seems the hardest part and again, Spry’s book will give you a lot of ideas. What is Your experience of Cognitive Behavioural Coaching? So, we’d love to hear your experiences, ideas, and questions. Please leave them in the comments below. The Cognitive Behavioural Coaching Pocketbook is full of tips, techniques, and tools to enable coaches, managers, and L&D professionals to facilitate transformational change in individuals.